Part of living a healthy lifestyle is transforming your new knowledge, eating plan, exercise plan or inspiration into a daily habit. 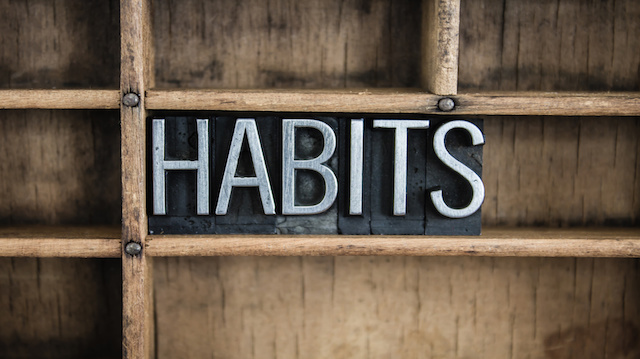 Teachers, bosses, medical professionals, life coaches, and just about every successful person stresses the importance of forming good habits, but have you ever wondered why habits are important? You’ll find here seven benefits to forming good habits and some practical tips to start creating new habits today. What is a habit? A habit is something you do daily without thinking much about it. You probably have a habit of waking at a certain time, brushing your teeth a certain way, and perhaps calling your mom once a week on a Tuesday night. Habits become such a part of your routine that they become who you are. Want to be a different person? Just start a new habit! The nice thing about habits is that you can change them. Old habits may be hard to break — it seems that the worst habits are the hardest to break — but it is possible. If you want to start eating healthier, all you have to do is skip your morning donut until it becomes second nature to turn down pastries at breakfast. If you wanted to become a marathon runner, you wouldn’t just jump into the first marathon offered by your city. It takes months or years of training to become fit enough to compete in a marathon race. Step one of reaching any goal is establishing a daily habit. If you want a better job, you must start the daily habit of looking for work. If you want to be able to lift 300 pounds, you must start the daily habit of lifting weights. Since habits become you, the habits that you choose to follow set the tone for your entire life. If you have a habit of greeting your children with joy, you will become a joyful person. If you have a habit of eating a vegetable with every meal, you will become a healthy person. If you have a life goal, it isn’t the goal itself that will help you reach your dreams, it is the habits that you form and follow while you are trying to get there. Habits are the basic building blocks of reaching any goal or succeeding in any plan. As humans, we tend to waste a lot of time. Most of us would rather not do anything difficult or challenging. However, if we create good habits, we become more efficient and this reduces how much time we waste. We all have days when we just don’t feel like working, exercising or eating well. But when these things are habits, they become second nature and we do them without thinking. When healthy eating becomes a habit, although you may eat one slice of cake today, you probably won’t eat more and will go right back to making healthy choices tomorrow. Self-motivate: Research shows that having both a large goal and small steps to reach it (your habits) is the most effective way to succeed. Your daily habits will help you achieve your goal. Create a behavior chain: Rather than the abstract goal of “I need to exercise daily,” create an action chain that helps you get there, such as, “After I get home from work, I will change into exercise clothes, socialize for thirty minutes, and then go for a run.” Research shows this kind of planning is more effective for creating healthy habits. Don’t fall off the wagon: When you are starting a new habit, little things can derail your effort before it becomes a habit. You can prevent this by finding out what causes you to want to quit and eliminating that trigger. You may also find ways to make it easier to settle in to your new habit. It could be as simple as changing into exercise clothes as soon as you walk in the door or removing junk food from the house. Creating a foundation of healthy habits will benefit your life from today far into the future. This is not an impossible task and a few simple tricks can make the process much easier. Follow these simple strategies to get on track and see your life blossom. Previous articleCan I Quote You on That? Should I? Hey Buddy!, I found this information for you: "7 Reasons Why It Is Important to Form Good Habits and How to Do It". Here is the website link: https://www.thealternativedaily.com/the-importance-of-good-habits/. Thank you.